Robbie was one of those dogs that, even as a puppy, he caught your eye. He wasn't flashy, or overdone, or extreme in any way, he just seemed to carry himself in a way that makes people look at him. Even at a tender age of 5 weeks old! You know when you are at a party and some people walk in and everyone looks? Well, for the dog equivalent, that would be Robbie! 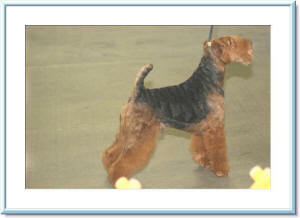 When he was about 7 months old, I attended the Great Western Terrier Specialty in Long Beach California (I think that I was showing his dam, K-See at the time, or it might have been his sire, Bentley). A couple that were attending the show, and lived near there, were referred to me. I had told a friend that I had 2 nice puppy dogs at home (brothers - Robbie and Cyril) and that while I had decided to keep Cyril, I thought Robbie was definitely quality to finish his championship ... but I only wanted to keep one brother. I wanted the other to go to a companion home. I ended up placing Robbie with this couple and they decided to hire Wood Wornall to condition and handle him to finish his championship. That he did! Robbie won a couple of 5-point majors (big wins! 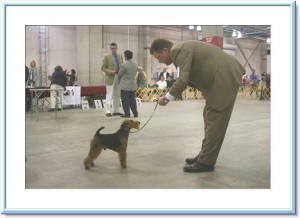 :-) at the Louisville Kennel Club (a big show) then came up to the Northern California Terrier Association show, where that year, the Welsh Terrier Club of America held it's floating National Specialty. 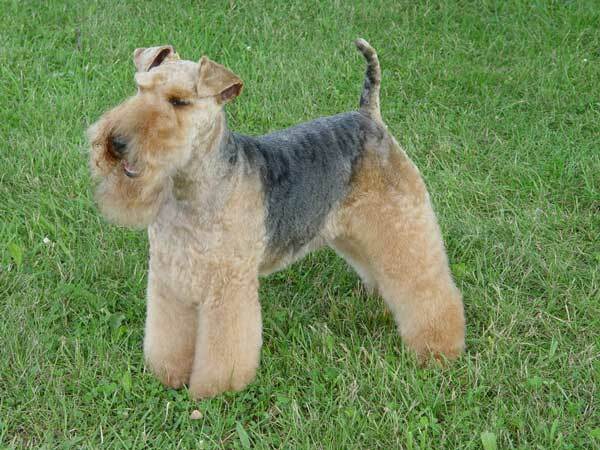 (note: Each year the Welsh Terrier Club of America holds it's National Specialty at Montgomery in Pennsylvania in October and holds a Floating National Specialty in conjunction with another terrier specialty in different parts of the US). In 2005, that show was in California. The day before this National Specialty, Robbie was awarded winners dog - finished his championship and was 'moved up to the specials class' (champion class). 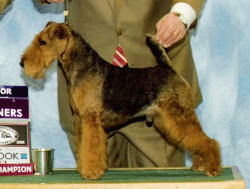 The next day, at the National Specialty, Robbie was awarded Best of Breed by judge Elliot Weiss! While the numbers of competitors at the Floating Nat'l is lower than at Montgomery (there were 25 that year), champions from all over the US come out to support it and compete. I flew down from Canada to watch the show, spent some time with his owners, and was on cloud nine when both days of the results happened! He looked beautiful ... just as a National Champion winner should look! That night, Robbie went home with his owners, slept on their bed in the hotel and came back the next day to compete again. After that, Robbie went back to being the companion pet that he was sold as and is the centre of their attention! Robbie's brother that I kept - Cyril - started his show career years later (2008) finished his Canadian Championship with group wins, placed in the Bred-By-Exhibitor Group, and got a 'major' at Great Western Terrier Association (owner-handled by me) and then finished his American Championship over Montgomery weekend (2008 ... and following in his dams footsteps from 2003!) -- conditioned and presented beautifully by Wood and Jenny Wornall and Andrew Peel. 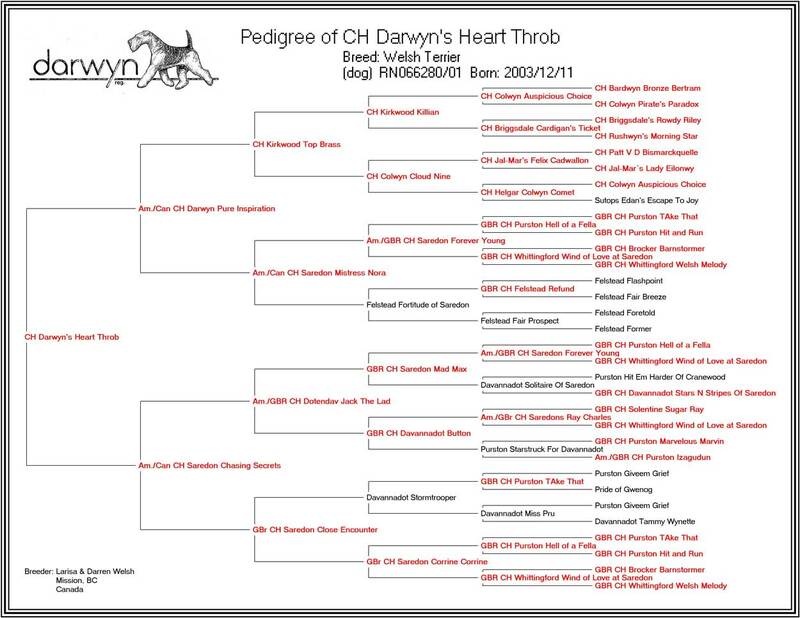 Click here to go to the WTCA Specialty Results for Robbie! Robbie at home as an (older) puppy in Southern California just hanging out! And now look at him at 6.5 years of age!